PA chairman blasts Israel ahead of publication of Trump peace plan. 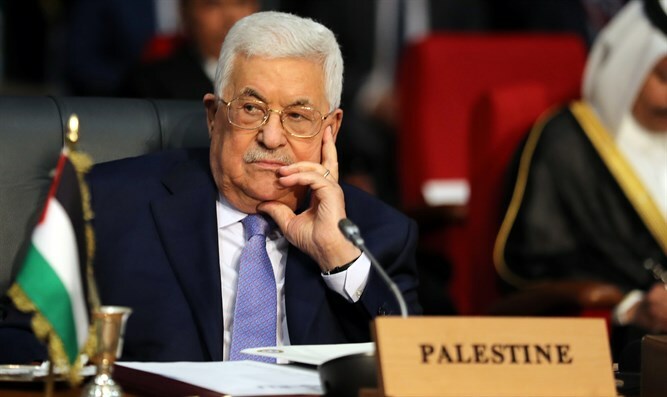 Palestinian Authority (PA) chairman Mahmoud Abbas spoke Sunday at the summit of the Arab League in Tunisia and attacked Israel and the United States. "Israel is not satisfied with the theft of land and resources, but also cut our tax money on the pretext that we are paying it to shaheeds and prisoners," Abbas said, in a reference to the Israeli Cabinet’s decision to implement the policy to offset the PA’s payments to terrorists. "Israel's goal, with the assistance of the United States, is to pressure us, but we are telling Israel that we will not give up our people, especially those who made sacrifices." "We are at the threshold of difficult times," Abbas added. "After Israel destroyed the agreements and ran away from all its commitments since Oslo, it continues its policy of destroying the two-state solution in a way that causes us to lose hope in the peace process. I make it clear that we will be unable to bear the current situation much longer, and therefore sooner or later we will have to take fateful steps." "Israel's attempts to normalize its relations with the Arab countries will not succeed," the PA chairman. "We warn you of Israel's attempts to push some of the countries of the world to transfer their embassies to Jerusalem." Abbas has rejected the US peace plan before it has even been unveiled.